Website Design Training Security Business | Designed in Word Press. 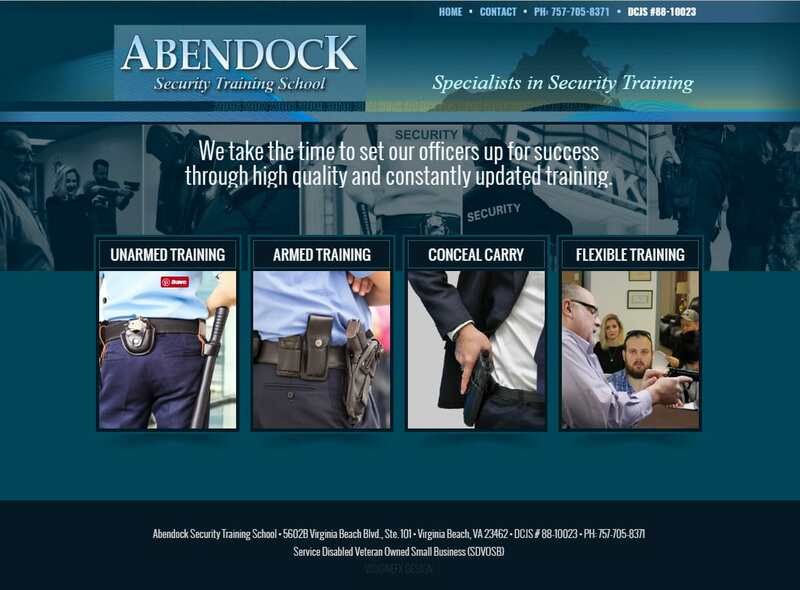 This website allows customers to sign-up and booking security training classes. VISIONEFX provides Web design for security consultants and companies. It features an online booking calendar and online payments for major credit cards are accepted online using Stripe. The website also features custom navigation flip boxes when hovered reveals website interior links. This is the 2nd design for Abendock since becoming a VISONEFX client in 2012. When searching Web design Virginia Beach, VA Beach Web Design look no further than VISIONEFX for all of your website needs. We are a professional web design company based in Virginia. We understand that great design elevates web sites above the rest and work to provide you the very best in web design. VISIONEFX provides services to national companies as well as small to medium businesses throughout the United States to include; custom web design, web development, E-commerce web design, Moodle website design, Word Press design, Joomla web development, SEO and web maintenance services. Call: (757) 619-6456 or email info@visionefx.net. VISIONEFX also has a Google 5 Star Review posted on Google My Business pages.